Pilous are always heard and never seen. While their name suggests soft fur – pilou in its modern expression refers to a type of cotton – it actually refers to the men who pound apples into cider, using wooden pilons. Pilous walk with a regular, stomping tread, making a rhythmic sound like that of apples being mashed, and that is all anyone knows of them. Nevertheless, Dubois fancifully describes these lutins as resembling large garden dormice, and that is as good a description as any. 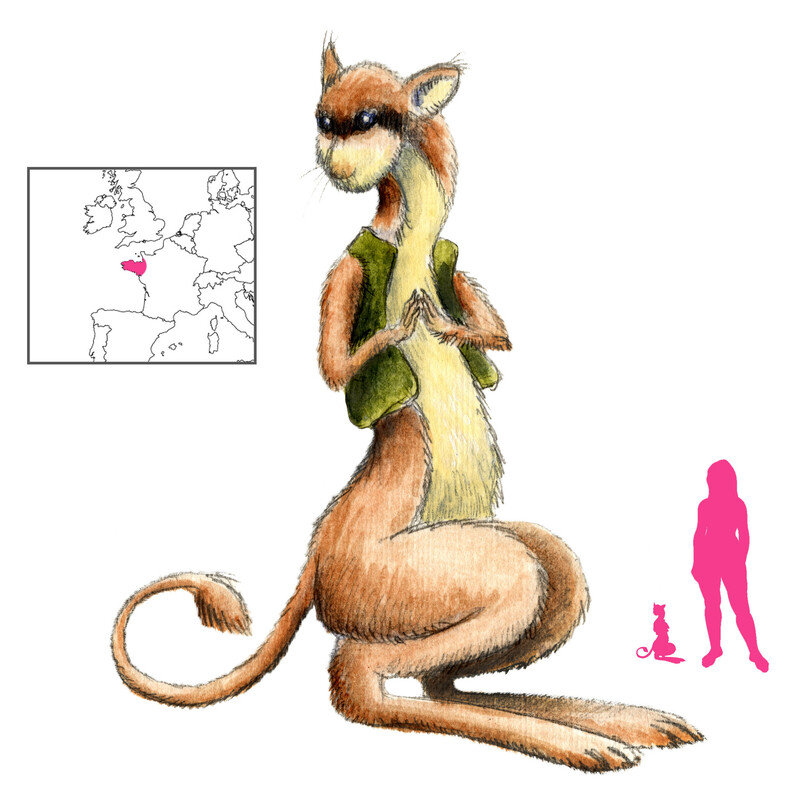 Pilous are native to the northwestern tip of France, specifically Brittany and Ile-et-Vilaine. They come out at night in the attic, in the rafters, in the walls, and start marching. They are not evil but mischievous, and delight in the noise they make. In Brittany, where they become Er-pilour-lann, they wield mallets with which they pound the walls of old houses. Most encounters with them are about their disregard for human comfort. A farmhand once went into the barn to fetch some hay when the thumping begin, the din seemingly coming from everywhere. He called his uncle, who implored the pilous “Would you, please, stop your noise so I could get some hay for my mare?” They stopped, but the moment the uncle stepped into the barn they started up again, louder than ever. Another time a group of men were in a barn when a pair of pilous started: one, two, one, two. “I’d like it better if there were three of you!” yelled one of the men, and sure enough a third pilou joined in. Other men started requesting more and more, and the number of pilous increased accordingly. The same stunt was later attempted by three bored young girls, but they requested too many, and soon the pilous were rattling their bed and knocking at their walls. The girls wisely went quiet, and the creatures eventually left. Attempts to put pilous to use have failed. One miser left oakum fibers behind in the attic in hopes that the pilous would stomp them flat, but he returned in the morning to find the material shredded and scattered all over the attic. d’Amézeuil, C. (1863) Récits Bretons. E. Dentu, Paris. Orain, A. (1899) Le Monde des Ténèbres en Ile-et-Vilaine. Revue de Bretagne, de Vendée et d’Anjou, XXI, Paris. Orain, A. (1901) Contes de L’Ile-et-Vilaine. J. Maisonneuve, Paris. Le Rouzic, Z. (1924) Carnac: Légendes – Traditions – Coutumes et Contes du Pays. LaFolye Frères et Cie, Vannes. The Polevik or Polevoi (from pole, “field”) is the Russian spirit of fields, plains, and noontime. His appearance varies considerably. In Belozersk District and the northern forest regions he is a man dressed in white. In Iaroslavl Province he is an ugly little old man. In Orel Province he is black as the earth, his head covered with green grass, and he wears no clothing. In Tula Province he looks like a shaggy-furred Leshy. Sometimes his eyes are different colors. 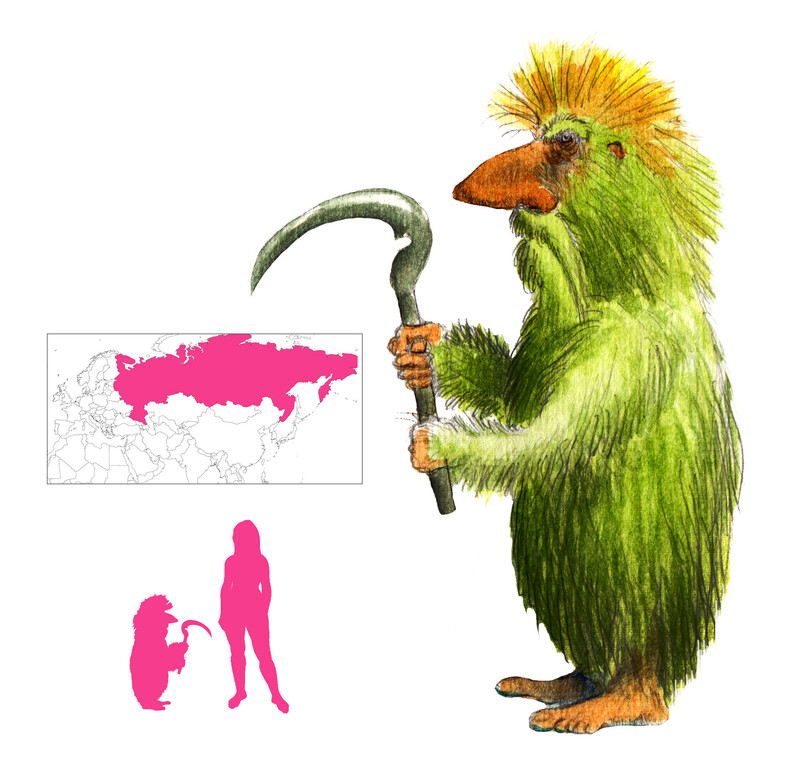 His skin and hair mirror the soil and vegetation of the fields, and his height grows and shrinks with the crops. Unlike some of the other spirits, the polevik can be benevolent or evil. A polevik is primarily seen at noon. He likes to lead peasants astray, losing them in endless yellow golden stalks of grain. He disapproves of laziness, and will strangle drunkards sleeping in the fields. Poleviks are capable of seeing the future, and in Iaroslavl Province their appearance is an ill omen. Poleviks are also accomplished horsemen and will ride horses across the fields at breakneck speed, running over anyone in their path. The female equivalent of the polevik, sometimes replacing him entirely, is the Poludnitsa, Poludnica, or Midday Spirit (from poluden or polden, “noon”). She can be a tall, beautiful woman in white; in Siberia she is an old curly-haired crone dressed in rags, while she has horses’ hoofs in Moravia. In summer, during harvest time, she walks through the fields, protecting the grain. If she sees someone working at midday she pulls their hair violently, twists their heads, and breaks their bones. Other times she quizzes people on agriculture, inflicting disease upon them if they fail to answer correctly. She enjoys misleading children in cornfields. Polevik children run around the fields catching birds for their parents to eat. They will smother anyone sleeping on the edges of the field. While poleviks can be destructive, a happy polevik will aid with the harvest, and crops will always be successful under a polevik’s patronage. To earn a polevik’s good will one must leave an offering of two eggs and an old rooster who can no longer crow, in a ditch when nobody is around. Traditional observances must also be followed, and nobody should work at noon. With the advent of Christianity, poleviks and poludnitsas became mere bogeys, monsters used to frighten children out of cornfields. Ivanits, L. J. (1989) Russian Folk Belief. M. E. Sharpe, Inc., Armonk, New York. MacCulloch, J. A. and Machal, J. (1918) The Mythology of All Races v. III: Celtic and Slavic. Marshall Jones Company, Boston. The Palis (“foot-licker”; rhymes with “police”) can be encountered in the deserts of Iran. 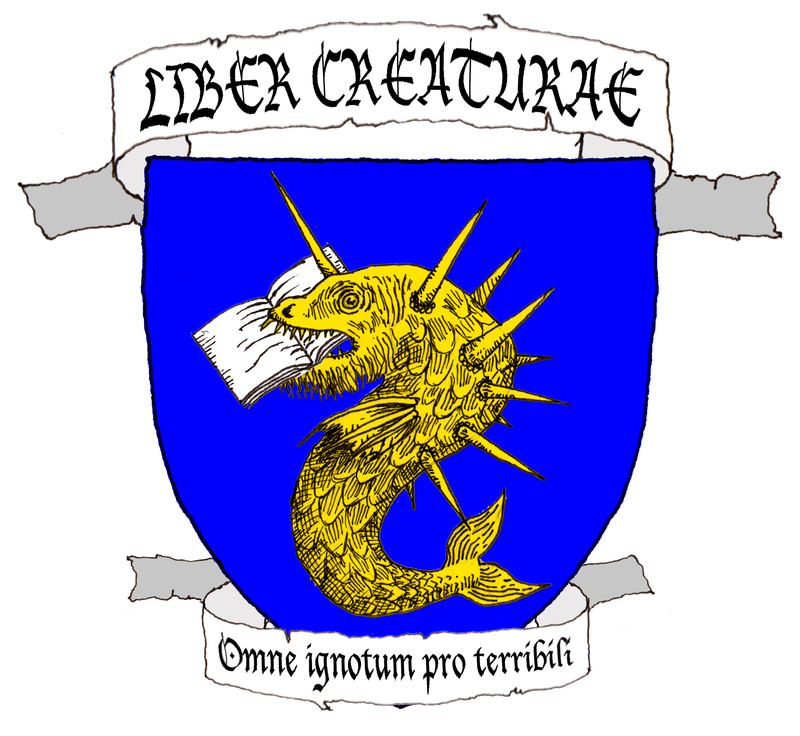 There is no description given for this creature, but its appearance is presumably as vile as its habits. A palis is a vampiric creature that preys on sleeping travelers. It locates their feet and proceeds to lick the soles, steadily draining blood away until the host dies. 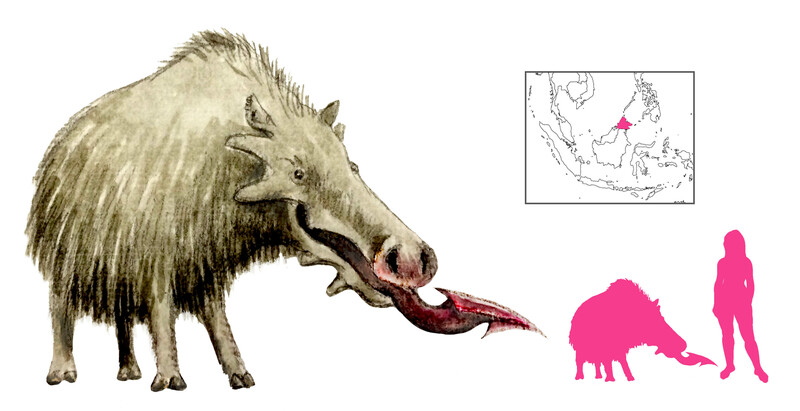 The Puaka (“Pig”) is a Dusun demon that guards water in eddies, and resembles a pig with a razor-sharp tongue. Puakas like to feed from trees, and stand on each other’s backs until they reach the branches. When you meet a Puaka, it will attack if you move, and come to a halt if you stop. If it catches up with you, it will lick your bones clean. To lose the Puaka it is recommended to cross a stream; the creature may follow you across the stream, but once on dry land it will pause to lick itself dry, licking the flesh off its bones in the process. “Puaka” and similar terms have meant pig in a number of languages – puaka in Rarotongan, Mangarevan, Rotuma, and Malay, vuaka in Fiji, puwaka in Malay, pua’a in Samoan, puaa in Tahitian, Marquesan, and Hawaiian, buaka in Tongan, and poaka in Maori. While this has been alternately compared to the Sanskrit sukara, the Latin porcus, and the English porker, the word seems to have had its own unique Polynesian origin. In some areas puaka has come to denote the pig-like demon; sometimes it loses its meaning as “pig” altogether, possibly due to the influence of Islam. Mackenzie, D. A. (1930) Myths from Melanesia and Indonesia. Gresham Publishing Company, Ltd., London.